This fabulous condominium townhouse will have you wishing you would have moved sooner! Upgrades galore add to the luxurious appointments in this better than new, 4 year old "Landmart" home. "The Orchid" model offers 1,677 square feet of living space above ground, with a full basement awaiting your finishing touches! "The Glades" of Valley heights is a quiet enclave of executive style townhomes, tucked under the edge of the Escarpment. Direct views of the escarpment in all its glory at your front door, offering extensive walking trails, conservation lands for hiking and manicured parks. Also, a short walk to the areas finest golf course, Dundas Valley Golf and Curling Club. The home features rich gleaming espresso oak hardwood flooring throughout the main level family room and the full staircase to the second level. Gorgeous porcelain flooring in the brick pattern greets you in the front foyer and extends throughout the kitchen and powder room. French door entry with transom and secondary picture window grace the front foyer. Two coat closets offer plenty of storage. The home opens up into a massive great room with soaring 9 foot ceilings! This is open to the gourmet dream kitchen, replete with many upgrades! The antiqued cream cabinetry boasts rubbed bronzed style hardware and a gorgeous custom range hood to co-ordinate. Stunning granite countertop on the main cabinetry plus the island which has a large breakfast bar and room for 3 stools. Lovely ceramic backsplash in a brick pattern style ties everything together. Top of the line appliances include an "LG" stainless steel side by side refrigerator with freezer drawer, "Samsung" stainless steel oven with glass cooktop, "Samsung" stainless steel built-in dishwasher and "Sylvania" stainless steel microwave. A double stainless steel sink is undermounted in the island, with gooseneck style bronzed taps. The open concept extends into the sunny south facing dining area with chandelier. Sliding glass doors offer a walk-out to the rear yard and an area to barbecue. The yard is fenced on two sides and is open across the rear to allow for landscapers to cut the grass for you! A two piece powder room completes the main level. It has porcelain flooring and gorgeous espresso coloured cabinetry with granite countertop. A glass vessel style sink with gooseneck style faucet add a touch of class. The second level offers three bedrooms, two full bathrooms and very convenient laundry room. The master bedroom is generous in size, with broadloom flooring. Two picture windows and a transom window offer plenty of natural light. Two full closets for him and her. The ensuite bathroom offers the same sumptuous espresso oak cabinetry and porcelain flooring. A large corner soaker tub plus a full walk-In shower! The two other bedrooms are the perfect size for the kids. Both offer broadloom flooring and double clothes closets. Picture windows offer views of the rear yard. 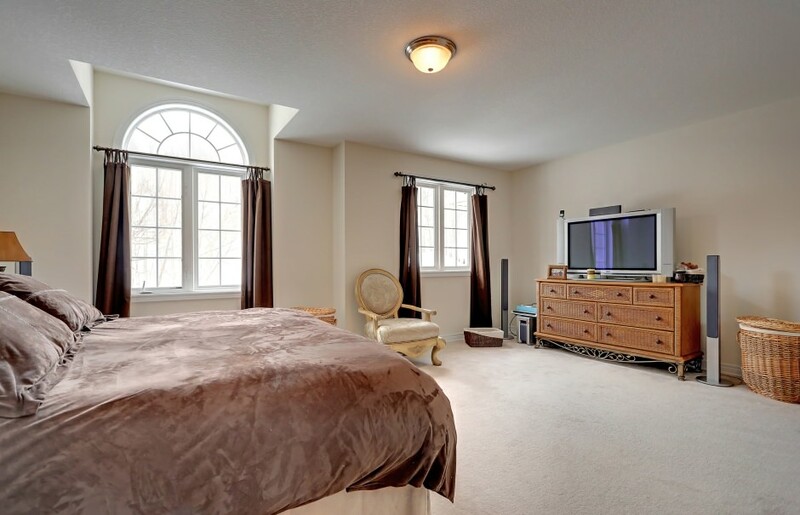 The laundry room is very conveniently located on this bedroom level. Two full size "Samsung" washer and dryer units plus a full size scrub sink and plenty of storage area too! The lower level is unfinished and ready to complete as per your taste. A bathroom has been roughed-in already. The space of approximately 800 square feet could accommodate a recreation room and another bedroom.